World Architecture News (WAN) features the unveiling of Louver House, a residential condo project designed by Rene Gonzales for Mast Capital. Poma Architectural Metals provided the metal louver system for the project, a custom design for which the property is named. Establishing an equilibrium between the interior and exterior with garden courtyards, open air spaces and louvered planar surfaces, the design of the building takes the typically centralized interior courtyard space of an art deco design typology and cuts it up, redistributing it evenly throughout the building while maintaining significant portions of the roof and ground floor as open space. Louver House designed by Rene Gonzalez for Mast Capital. Photo courtesy of Mast Capital. Measured and contemplative, the design of this residential building provides a living experience that responds to the special qualities of the site. Allowing for a balance between solidity, light and air, the façade combines modulated silver travertine feature walls and aluminum louvers. Mast Capital has completed its first luxury condo project in the sought-after South of Fifth neighborhood. 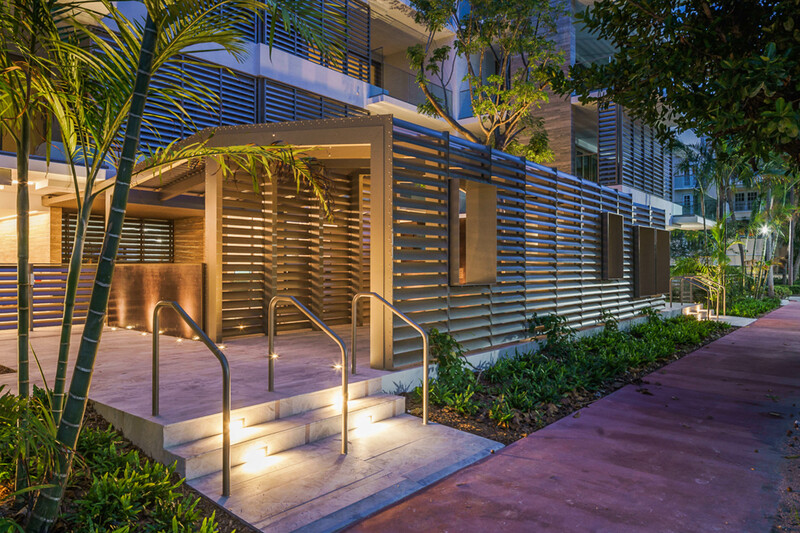 Known for leading marquee transactions in Miami and beyond, real estate investment firm Mast Capital now proves its expertise in luxury development with the completion of Louver House, the firm’s first condo project in its diverse portfolio. Designed by award-winning Miami-based architect Rene Gonzalez, Louver House is a testament to the level of quality and high design that Mast Capital will deliver to subsequent projects. The four-story building brings 12 residences to the sought-after South of Fifth neighborhood and pays homage to the rich history of Meridian Avenue. Architect Rene Gonzalez incorporated the South of Fifth community’s distinctive elements, like its lush tree-lined streets and storied past, into the very fabric of the building. He started by preserving the memory of a historic Belvedere bungalow that was once on the Louver House site. In its exact place, he created a louvered bungalow that will be the focal point of the entrance. Mast Capital also brought on artist Michele Oka Doner to create artwork that will hang in the lobby area. The space will be draped with plants from landscape architect Savino & Miller. “The architectural design for Louver House has everything to do with the beauty of the building’s surroundings; we wanted to create a substantial and substantive piece of architecture that pays deference to its environment and urban condition,” says architect Rene Gonzalez. Read the article in its entirety at World Architecture News.